In the 21st century, whether the job is evangelism or social outreach, women missionaries are essential to cross-cultural work. Who has not heard of Lottie Moon, Gladys Aylward, Elisabeth Elliott, Mother Teresa, and many others? Yet when the “modern missionary movement” began, many people considered pioneer mission work too dangerous for women. Throughout the history of Christianity, the typical missionary had been a celibate male. But a breakthrough came in the early 19th century: When the American Board commissioned the first American foreign missionaries, the young volunteers refused to go unless they were allowed to marry. Chief among the proponents of missionary marriage was Adoniram Judson. During the clergy association meeting that authorized the first American mission, he boarded with the family of John Hasseltine, a deacon at the local host church. As tradition has it, Hasseltine's daughter Ann waited on the table and caught Adoniram's eye. 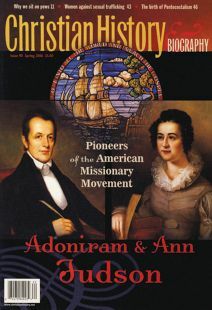 After considerable pressure from him—and opposition from others who thought she was throwing her life away—Ann agreed to marry Adoniram and thereby became one of the three pioneer American missionary women. Of the three young wives, Ann's career was the most extraordinary. Her accomplishments were so phenomenal that she set high standards for future women missionaries to come—and proved for all time that women belonged in the mission field as much as men. Ann was not content to remain in her parents' home until marriage. Seeking usefulness, she went out into the world to teach young children and soon gained a reputation for helping to bring her pupils to the point of Christian decision. After Adoniram Judson met Ann at her father's house in Bradford, he proposed marriage to her by letter. But Ann was unable to answer him immediately—not only because she barely knew him, but because she realized she would be marrying not only a man, but a vocation. In an age when women's employment opportunities were limited, marriage to a minister was the surest path to Christian service, allowing evangelical women to act as associates of their clergy husbands in ministry directed toward women. The foreign mission movement was on the cutting edge of this development in women's ministry. By marrying a missionary, Ann Hasseltine legitimated the role of the missionary wife as a “calling.” With her success, other women could hope for marriage to a missionary as a solution to their own vocational desires to serve in an arena wider than small-town New England. The revolutionary public justification for including women in the foreign mission enterprise was to reach the otherwise unreachable women and children, since men would have little access to them in the gender-segregated societies of the East. The role of the missionary wives, therefore, went far beyond acting as traditional helpmeets for their husbands. From the beginning, women had to be pioneers of mission method every bit as much as their husbands. Ann's own goals for mission were shaped by her previous employment as a schoolteacher. While in America, she had found that conversion often took place in the context of revivals in school under the influence of a Christian instructor. Ann's hunch that teaching would be an appropriate forum for women's missionary work was confirmed when she visited the school for mission children run by the Baptist wives in Calcutta, where the Judsons stayed when they first arrived. Once in Burma, Adoniram spent all day in language study in view of his central role as translator of the Bible into Burmese. Ann was left to manage the family and household matters and so could not begin language study until 10:00 each morning. She endured constant interruptions, especially after the birth of their first child in 1815. But by handling all the household affairs, Ann Judson used Burmese until her spoken language was better than her husband's. As soon as possible, Ann gathered together a group of female inquirers into a Sabbath Society where she read the Bible to them and tried to tell them about God. While Adoniram discussed religion with the men, Ann met with the women, visiting, praying, and talking with them. She also visited the viceroy's wife regularly, in hopes that making friends in high places might someday reap benefits to the mission. Ann assisted Adoniram in his literary work by translating several tracts, as well as the books of Daniel and Jonah, into Burmese. She also wrote a catechism in Burmese. In 1817, she became interested in the many Siamese (Thai) in Rangoon and began to study their language. She became the first Protestant to translate any of the Scriptures into Siamese with her translation of the Gospel of Matthew in 1819. She also translated the Burmese catechism and a tract into Siamese and endeavored to introduce Westerners to Siamese religious writings by translating a Siamese sacred text into English. It was not her evangelistic and literary accomplishments, however, that made Ann Judson's name a household word in the United States. Rather, it was her status as heroine and savior of her husband during the war that broke out between the British government and the Burmese in May of 1824. After her untimely death, the life of Ann Judson became a stock item of female hagiography across denominational lines. Her courageous and activist career provided an inspirational model for missionary women in the 19th century and continues to do so today. Dana L. Robert is professor of world Christianity and the history of mission and co-director of the Center for Global Christianity and Mission at Boston University. This article is adapted from her book American Women in Mission (Mercer University Press, 1997).